Your Kero-Sun, Toyostove, Toyoset or Toyotomi Heater will have a Lot # and a Serial # on the heater. Look for a "Letter" near the end of the Lot # to identify your Model of heater. 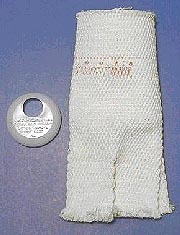 Original Kero-Sun / Toyostove Wick #22742213 (All Cotton). Are sold out and are no longer available. We have a premium quality replacement wick (#NL5007) that is an exact replacement at a lower price. Without Pins (Old #005025) fits: Moonligher D,E,F,G, OMNI-15 Pre-A, A,B,C, RB-2 (Rainbow 2), TSC-12, TSC-15 Wick Guide Installation Cap #22742235 Sold Separately. Same as Northern Light Wick #NL5007 (All Cotton Also available in High Performance Fiberglass, use Northern Light Wick #NL5008.